A few times every week, I’ll play World of Warcraft (s atvi) with some great friends. Rather than type, we’re much more comfortable using a VOIP solution like Skype. Nothing beats actually hearing the sarcastic abuse your friends heap on you. VOIP and video chat solutions are becoming much more common and user-friendly. While I’m going to go over multiple programs (Skype, iChat(s aapl), and FaceTime), my preferred app is Skype because it’s available for most platforms, allowing you to talk to people on almost any kind of hardware. 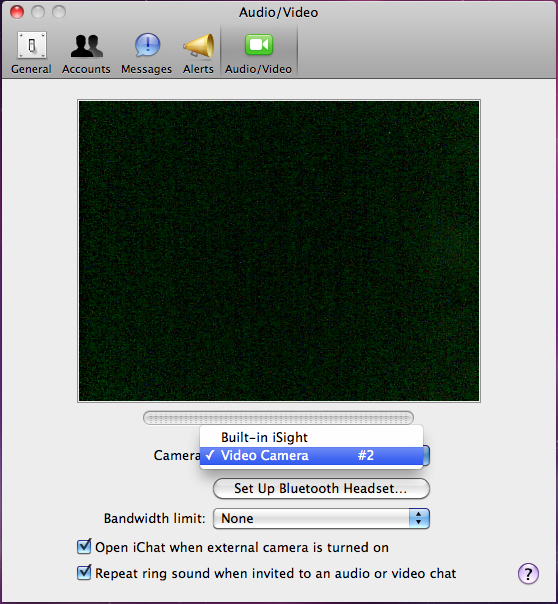 If you’re using the built-in microphone and iSight camera, you can skip over this part. Please, for the love of Steve Jobs, don’t use the built-in microphone. You will end up producing a sound not unlike yelling into a flushing toilet bowl, albeit one with great acoustics. Headsets with boom microphones are relatively inexpensive at around $30, so do your listeners a favor and buy one. 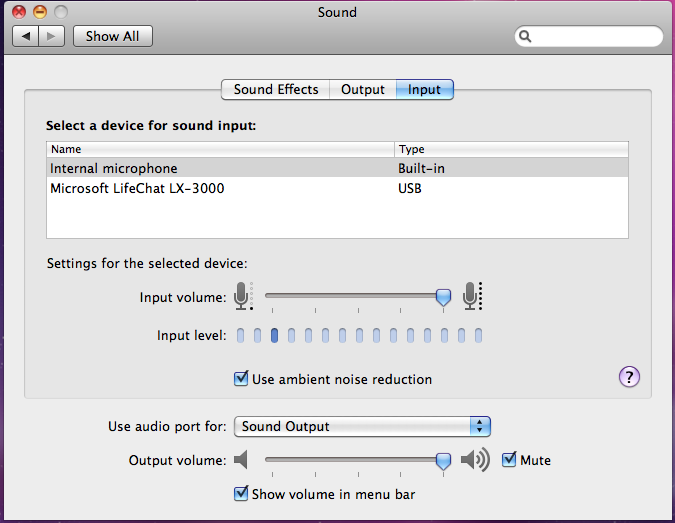 If you have an external headset, open up your System Preferences and choose Sound, then go to the Input tab. Make sure your microphone is plugged in to your Mac, and that OS X sees your microphone and you’ve set it as the default input device, and set the headset as the default output device. Now, the dirty secret is, this isn’t really going to change much in many programs, except for iChat. Since it’s unlikely you’ll keep your headset plugged in all the time, when you unplug it, OS X will go back to the default setting of the built-in gear. Even so, it’s the perfect place to make sure OS X can detect and use your hardware. Apple provides an A/V communications program on every Mac called iChat. It’s very easy to set up and use, but for video, the protocols it supports are limited. Google Video Chat (s goog) accounts, for instance, are rumored to not work well with iChat video. MobileMe and AOL Instant Messenger (s aol) accounts work well, however. As with most Apple programs, setting up iChat is pretty easy. 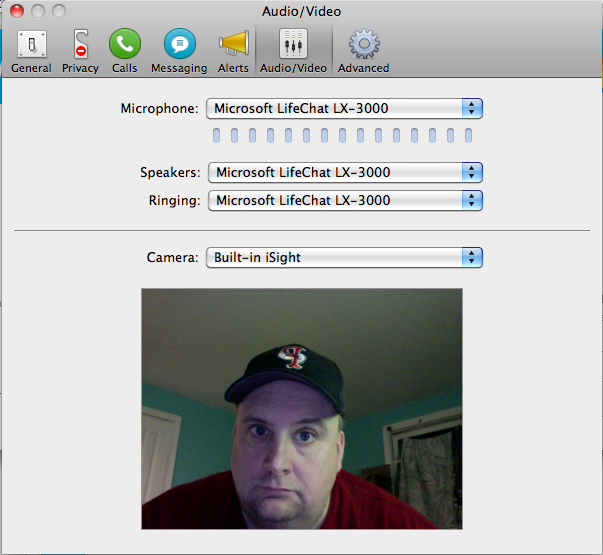 Open up the iChat Preferences, choose Audio/Video, and choose your camera from the drop down list. I’m using an Xbox 360 Camera (s msft) as my test, so that’s why I have a “Camera #2” showing. So long as you have a recent USB webcam (one that’s USB Video Class compliant and uses USB 2.0), it should be recognized under OS X 10.6.6 (the latest version). FaceTime for the Mac lets you video chat with a supported iOS device or another Mac user. Currently, FaceTime only supports recent iPod touches, iPhone 4s, and Macs running 10.6.4 or higher, making the number of people you can reach fairly limited. Another limitation is that I couldn’t get FaceTime to detect my external video camera. This could be a major issue if you’re using a MacBook with the lid closed, or a Mac mini. Setting it up is easy, though, if you’re content with your built-in iSight camera. You download the program from Apple’s site, and log in with your Apple ID. FaceTime will then prompt you for the email address you want to be identified by. Below is a cropped screenshot of the settings panel, but all it has is an On/Off switch and a display of what email addresses you’re using. FaceTime uses your default audio input and output devices. As I mentioned earlier, Skype is my favorite of the video conferencing apps. It’s easy to set up, and since everyone is using the same network (Skype doesn’t support multiple protocols like iChat), a lot of hassles are eliminated. If you haven’t already set up a Skype account, the first time you open the app you’ll be prompted to create one. Then go to Preferences, Audio/Video and select your preferred Microphone, Speakers and Camera from the drop-down source lists. Skype lets you specify different devices for in-call audio and the ringer for incoming calls, which can be useful if you have your headset plugged in but you aren’t wearing it. What I love is since Skype lets you call toll-free numbers free of charge, you can easily take notes or browse the web while on a conference call without having to awkwardly shoulder your phone. If you’re video chatting for work, still make sure you’re in business attire when working from home. Also, if it’s a business call make sure your on-camera surroundings are neat, and your camera isn’t aimed at the pin-up calendar on your back wall. And make sure you’re wearing pants, just in case you need to stand up suddenly. I enjoy excellent audio – whether podcasts or Skype – on my 17″ MacBook Pro by using a ProSonus TubePRE pre-amp and a Heil PR-40 mic. Honest, warm voice – always impresses my audiences. Spend a little more on audio gear … audiences will “forgive” you if your video isn’t perfect – but you’ll lose listeners with poor audio quality.